The magical job of the makeup stylist creates or enhances the image of the model to project whatever mood that the shoot or fashion show requires. In this interview you will have a glimpse into the life of one of the great stylists of the fashion industry...The fabulous Felicia Gray! Copa: Felicia, we understand that you are a native Washingtonian and attended Ballou H.S., were you interested in fashion at all during those years? Felicia: No, I actually stumbled across my passion almost a decade ago. I worked for a company that did a did government PSA's and photoshoots and would see the invoices come across my desk as to what they were paying make up artist and I negotiated with the owner that if he sent me to school to become a MUA (Makeup Artist) then I would do it for the company, and he did! Initially, I just looked at this from the money aspect but as I became more involved, it turned into my passion. Copa: What is it about the art of applying makeup that moves you in that special way? Felicia: When I start with an empty/blank canvas and I can manipulate the face with make up to create a masterpiece. At the end, I step back and often amaze myself at my artwork. Copa: Would you consider yourself more of an artist or a technician and why? Felicia: I would consider myself an artist. When I am on assignment and the client has not provided me images or ideas as to the look they would like to achieve, it is left up to my imagination to create...you must be able to envision and implement! Copa: We know that you have been working with makeup for quite some time now, do you remember your first assignment and what it was all about? Felicia: I do remember my first assignment! 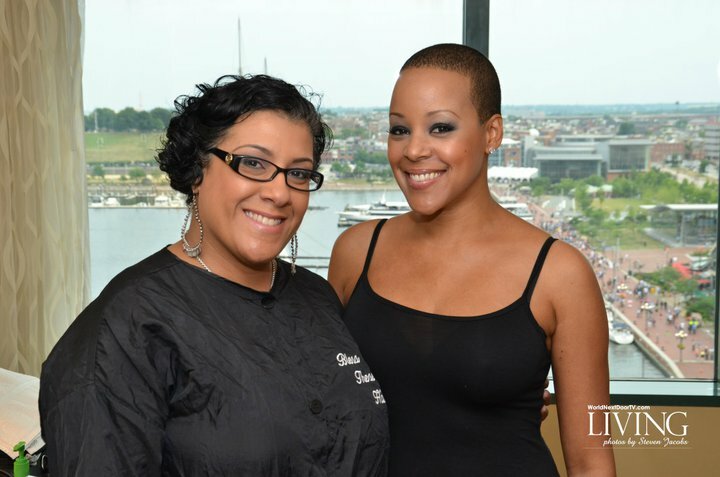 It was for a red-carpet event for Heart and Soul Magazine and my client was the beautiful Sonya Lowery. I was so nervous but she was a gem! Sonya was patient and kind and help open other doors for me. I will never forget her! Felecia delivers detailed skill with her makeup artistry. Copa: I can distinguish your work from other makeup artists, what is your philosophy in applying your products as it relates to each individual assignment or individual? Felicia: Less is more, is my philosophy! At the end of my sessions with clients, I want them to walk away still feeling like themselves but more fabulous. Copa: Where was the most interesting location you have worked? Felicia: Cancun Mexico with the Washington Redskins Cheerleaders. As much as I loved this assignment, it had to be one of the most difficult! Very early call times and very late end times. Climbing over boulders, in extreme heat...anything to get to the shot...but, it was all worth it! Would I do it again? Yes! Copa: What are what you would consider to be the best makeup products to use for the best results in photo shoots? Felicia: For most photoshoots, I use Black Opal for women of color or Kryolan for caucasian women, depending on skin type. Copa: How do you and the photographer collaborate on specific looks or themes on special shoots? Felicia: We use mood boards. When planning a shoot, you must first have a concept. Put together your team. You will then work together and begin to think of looks for hair, make up and styling until your vision comes to life. When doing a collaboration, each artist should walk away knowing that the photographer has captured something that would benefit the entire team. Felicia: I have not experienced that...fingers crossed that I never do! Copa: Where would be the best place in the world where you would prefer to shoot and with which photographer? Felicia: Paris, France would be a dream come true. There are quite a few photogs that I would love to work with but to name a couple, Eric Ouaknine and Robert Voltaire are some of my favorites! Copa: How long have you worked with Crystal Couture Fashion Show and would you please share some of your wonderful experiences behind the scenes that make it all happen? Felicia: The Crystal Couture Fashion Show is by far my favorite in the DMV area! I have come to know and love Maggy Francoise and her team who puts on an amazing show each and every year. I have been Lead MUA for the past 3 years and this show has helped me grow, both professionally and personally. With any fashion show, there are challenges and opportunities, you just have to be able to recognize both...at a very fast pace! Copa: If you had the opportunity to live in work in New York would you take it, or would you like to remain in Washington, DC and why? Felicia: Washington DC will always be home but you never know what God has in store for me! I am following HIS lead on this subject, HE knows my passion, and what is best. What is meant for me, will be for me, no matter where!